Wondering what it’s like to be a new engineer at one of Resolute’s operations in Ontario? So was Patrick Ellard, when he applied for the new Engineering Graduate Program nine months ago. 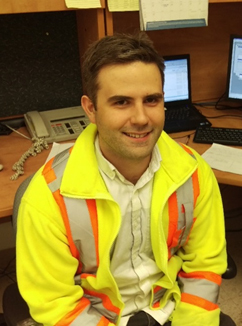 Now he’s in our pulp and paper mill in Thunder Bay (Ontario), working with the mill engineering team. Every day, his team works to solve the many challenges this dynamic industrial environment is certain to provide. Here’s his take on the job, the industry and his experiences. When talking to people about my job, the main thing I stress is the variety of opportunities here. There’s a kraft mill, a newsprint machine and steam turbine power generators. Each area offers unique challenges and a variety of learning opportunities. I just can’t think of another industry where you get to see so many different processes on one site. What I enjoy the most is that when you work on site like this, you get to see everything. A lot of my friends who are at engineering consulting firms tend to work remotely on projects. They could be working from a desk in Vancouver drawing something on AutoCAD® for a project that’s in New Brunswick. They get a lot of pictures and videos as the project comes together, but they might never actually see it in person. Here, you can see every part of a project, from the concept and design stages right through to the finished solution and how it’s all part of the process. How do you contribute to the mill’s continued operation? The process of making pulp or paper requires continual tweaking, and there are always new technologies to implement and inefficiencies to investigate. My job is to figure out how to implement the right solution based on certain parameters, such as cost or physical space. I’m a mechanical engineer, but this is a dynamic environment and solutions come from everywhere. Often, you have to understand something about the different disciplines, such as electrical and even civil engineering. For example, we had to install a new ammonia offloading area and storage tank, and, to do so, we had to build an unloading ramp and tank containment, which involved a lot of concrete work and rebar. The disciplines here are tightly interwoven. You can’t just be a mechanical engineer; you need to become familiar with everything. On that project, for example, one of my tasks was to familiarize myself with electrical systems because DCS (distributed control system) monitoring and alarming needed to be incorporated to provide operators with constant feedback. My father is a mechanical engineer at a paper mill, so I grew up being somewhat familiar with the industry. It has seen challenges and mill closures, but when faced with adversity, we need to look at innovative ways of remaining efficient – such as the cogeneration turbine we have that sells power back to the grid. Challenges force us to come up with unique solutions, and in my mind that’s the definition of what an engineer does. How are you learning on the job? It sounds funny, but what surprised me most was how much I didn’t know. When you finish school, you feel like you know a lot about engineering; but when you get into a real-world environment like this one, you know very little compared to the people who have been doing this for a long time. I have a great mentor, Ron Sundell, [a Capital Project Leader who has been working at the Thunder Bay pulp and paper mill for 34 years!] who is really helpful – especially when it comes to answering all the questions I’m afraid might sound dumb. But, really, everyone I’ve come into contact with has been very helpful. They understand that this is a learning position and that I’m bound to make a few mistakes along the way. There’s a lot to know. I’m making steady progress, and now I’m managing my own small projects.